Innovation is defined as the creation and commercialization of a new product and new technologies, the use of new production processes and labor inputs, or the conquest of new markets. The knowledge economy implies that innovation is more and more the outcome of interaction between firms, universities, public institutions, and consumers. Networks of innovation create new knowledge and contribute toward commercializing these, embodied in new modes of production and distribution. Innovation stems from technological, organizational and distributional change. Innovations. Journal of Innovation Economics & Management (JIE&M) is an academic journal dealing with the evolutions and transformations of the economy and society. How do firms conceive innovation processes? How does innovation impact on firms’ competitiveness and performance? 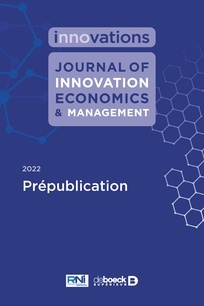 The journal hosts contributions on analyzing how innovation can be realized, strategies of appropriation, and those of the diffusion of knowledge on an international scale, where MNCs dominate the context of competition and highly skilled human resources are a precious asset in order to survive. JIE&M readers also enjoy discussions on the most appropriate management tools in order to have a better understanding of how to operationalize and implement innovation. JIE&M is keen to promote pertinent approaches and methodologies to analyze a firm’s technological opportunities, organizational strategies, and the integrated management of research and development projects, marketing and finance. Technological change, entrepreneurship, firms’ strategies, public policies, the evolution of social relations, economic cycles, but also the constant need in our societies for new developments of all kinds, are the issues explored within JIE&M. The Journal was founded in 1995 by Sophie BOUTILLIER and Dimitri UZUNIDIS.